Amsterdam has a reputation as being a more adult holiday destination. However there is far more to Amsterdam, as the city does have some family friendly attractions too. Perhaps one of Amsterdam's boldest attractions, NEMO was designed by architect Renzo Piano, and resembles a half submerged ship. It stands majestically on Amsterdam's Eastern Dock and is an instant draw for anyone in the mood to explore. It is full of remarkable, interactive displays, from small terminals to huge activity areas. The exhibits are also very well spaced out so it never feels too crowded, even with parties of school children that often attend. The Plantagebuurt walk is a beautifully scenic excursion that allows you to take in some of Amsterdam's most arresting views and architecture. Starting near the NEMO Science Centre, you can begin your stroll through this attractive neighbourhood, which includes the original guild house of Nieuwmarkt Square. You can also enjoy the fascinating flea markets or immerse yourself in culture and visit the Rembrant House Museum. Also in the Plantagebuurt district is Artis, Holland's longest serving zoo. Now nearly 200 years old, there's still a wide variety of animals for kids to see and enjoy. You can even pop along during feeding times of animals such as vultures, sea lions and penguins, as well as more carnivorous animals. The Artis also boasts a fascinating botanical garden, aquarium, planetarium and butterfly pavilion. Amsterdam is one of the worlds most bike-oriented cities and riding a bike is second nature for the locals. Because the city is designed around bike riding, there are many routes that are perfectly designed to cycle around. This is a brilliant way of seeing the city, and cost effective too, with many bike rental companies in the city who cater for families with children of all ages. If you're done pedalling the historic streets of Amsterdam, you can see it from a completely different angle. 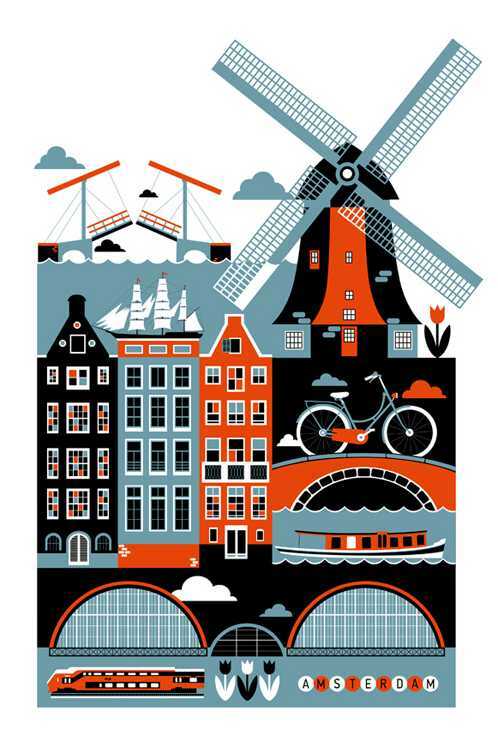 Amsterdam's canals provide a network of intriguing transport ways throughout the incredible architecture of the city. There are over 100 kilometres of canals that make for a rewarding exploration, and you can easily see how Amsterdam has a reputation of being 'Venice of the North'. Guest contribution from I Dream Elephants who offer a range of delightful outfits for children, with brands such as the Netherlands' Imps and Elfs clothing. The Imps & Elfs clothing, the factory lies in the south of Amsterdam, where you'll find Amstelpark. It's free to get into Amstelpark, and the rides and attractions are very reasonably priced. Keep your children entertained with the activity playground, or take them to see the chickens, goats and donkeys. You can also take the mini Amstel Train to the miniature golf course.